The team of Givat-Haim, Champion of Israel in 1975. 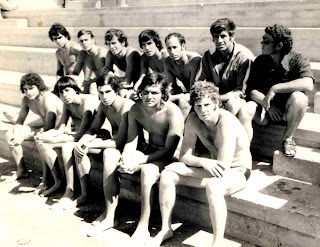 Givat-Haim has been the most successful team in the history of the Israeli Water Polo by winning 20 National Championship titles and 18 cups from 1966 to 1991. Seated 1 row L-R: Eitan Dreifuss, Eyal Eisner, Uzi Less, Piterberg, Yoel Samuel. Seated 2 row L-R: Amram, Dubi Krol, Avraham Koreen, Benny Lang, Gershon Shefa, coach/player: Micha Kanitz , assistant coach and manager: Miki Hadar.